This will be the second year for the soccer charity game at the Cedar Springs Sports Plex. The photo above shows action from last year’s game. Courtesy photo. March 4 at 5 p.m. The Great Lakes Wanderers will hold their annual arena soccer charity game on March 4, in memory of Brison Ricker, a Cedar Springs resident and avid youth soccer player. Brison lost his battle with DIPG, a rare pediatric brain cancer, in January, after a two-year battle. He was an extremely brave young man. We’d love to pack out the Cedar Rock Sports Plex with fans, with proceeds going to Team Rickerstrong to help cover medical costs. 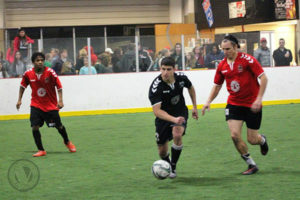 Kickoff will be at 5 p.m.
We have players coming in from various pro teams, local semi pro teams, national teams and the community to play on the Great Lakes Wanderers team, with all of them volunteering their time. Our opponent is the Detroit Waza Flo of the Major Arena Soccer League 2nd division. It’ll be a great game, packed with lots of entertainment for only $5! Halftime will feature a freestyle show; there will be a player meet and greet with autographs on the field after the game; jerseys will be auctioned off; and more. Come on out to have some fun and support a good cause. We hope to see you there!